Royal Navy Crete 1899 | The British in Crete, 1896 to 1913. While the quality of the text below may leave something to be desired, the story it tells may strike a chord with those who have been following the seemingly everlasting debates as to whether or not to expend land, resources and water on building golf courses on Crete. Taken from the Navy and Army Illustrated of 20th (?) 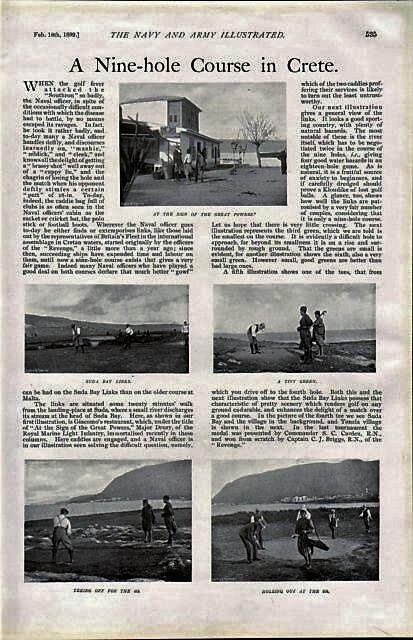 February 1899, the article tells the story of the golf course at Suda Bay, Canea. Described as originally having been laid down by officers from H. M. S. Revenge “…a little over a year ago. Since then succeeding ships have expended time and labour on them, until now a nine-hole course exists that gives a very fair game. Indeed many Naval officers who have played a great deal on both courses declare that much better “gowf” can be had on the Suda Bay links than on the older course at Malta. The site of the Suda Bay golf course still retains its connection with the British military. Today it is the location of the Commonwealth War Graves Commission Cemetery, containing not only the remains of those British and Allied troops who died on Crete during WW2, but also a small number who died on the island at other times, including during the Intervention period. This entry was posted in British Army in Crete, European Intervention Crete, Royal Navy in Crete, Royal Sussex and tagged European Intervention Crete, H.M.S. Revenge, Navy and Army Illustrated February 1899, Royal Navy Crete 1899, Suda bay golf course 1899 on January 17, 2016 by Mick McT.